Voronezh factory RUDGORMASH. 79 years in mining industry! 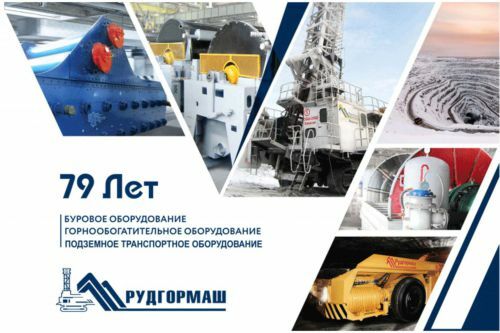 Today, On July 01, 2018 RUDGORMASH company which is one of the most famous mining machinery producers is celebrating its 79-th birthday. Almost an jubilee )))..
Today RUDGORMASH is not just a factory but a group of companies that includes several dozens of sub-companies and dealership centers. RUDGORMASH company was founded on July 01, 1939. For 79 years it has been the largest complex equipment supplier to the mining companies of Russia and other countries of near and far abroad. Over 1200 dedicated people are employed here at Rudgormash. In 2017 LLC HC Rudgormash was ranked “Leader of industry in 2017®” by the “Russian national business rating”. The company took the first place in the rating of activity status according to the state statistics service data. Today we summarize the results of our hard but rewarding work! It is safe to say that our goals have been achieved! Our company is celebrating its another anniversary proudly intact! Certainly, dear collegues and partners, this is our mutual achievement! Thanks to you and your efforts, patience and understanding our company is growing big and taking premier places! Thank you for commitment! For our mutual special occasion! For RUDGORMASH!